Laurel and Hardywood attendees are in for a special treat during the Saturday night (July 5) banquet at Heritage Square (current site of the “Berth Marks” Palms/Pottsville Station). We are pleased to announce that the US premiere of the Lucky Dog Theatre’s “Hats Off to Laurel and Hardy” will be presented that evening. This loving tribute to The Boys stars Philip Hutchinson (as Ollie) and Tony Carpenter (as Stan) who will join us straight from their national UK tour of the show. The production has played to rave reviews and received a standing ovation during the recent Sons of the Desert convention in Manchester, England. 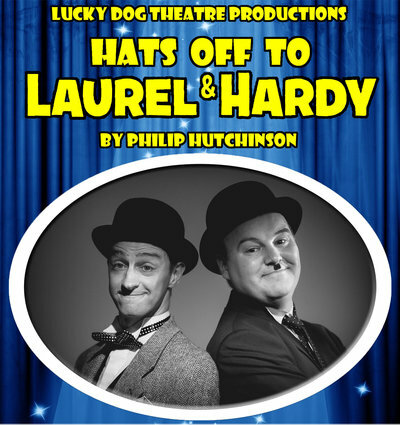 “Hats Off to Laurel and Hardy” is a new show by Hutchinson about the lives of Stan and Ollie. It chronicles their early years, steady rise to international stardom, movie careers and European stage appearances. It accurately and affectionately details the team’s commitment to their work, the appreciation of their fans, the love of their wives and their unerring devotion to each other. In the one-act version of the show during the 19th International Sons of the Desert Convention, you will see recreated highlights from Laurel and Hardy’s films, accompanied by a little singing and dancing. To view a brief preview of “Hats Off to Laurel and Hardy,” go to http://youtu.be/k5tWLTSEV-g. More background information about the show and its performers is at www.luckydogtheatreproductions.com. Philip and Tony are looking forward to appearing at their first international Sons convention and meeting you there!